Hawaii's Luis Avila celebrated with teammates after hitting a solo home run in the first inning of Sunday's game against USC at Les Murakami Stadium. The Hawaii baseball team tested Southern California's No. 24 ranking last weekend and won two of the three games with the Trojans. This week, Arkansas, Texas-Arlington and Washington will test the Rainbows, who are No. 24 in the latest Collegiate Baseball poll. Today: Washington vs. Arkansas, 2:30 p.m.; UH vs. Texas-Arlington, 6:35 p.m. Tomorrow: Arkansas vs. Texas-Arlington, 2:30 p.m.; UH vs. Washington, 6:35 p.m.
Thursday: Texas-Arlington vs. Washington, 2:30 p.m.; UH vs. Arkansas, 6:35 p.m.
Friday: Washington vs. Arkansas or Texas-Arlington, 2:30 p.m.; UH vs. Arkansas or Texas-Arlington, 6:35 p.m.
Saturday: Arkansas vs. Texas-Arlington, 2:30 p.m.; UH vs. Washington, 7:05 p.m. The four teams are in the five-day First Hawaii Title Rainbow Tournament that opens today at Les Murakami Stadium. "This field is stacked," UH coach Mike Trapasso said. "Arkansas is ranked, undefeated and has two pitchers who have each allowed just one earned run. "Washington is 8-2, playing really well and have a premier pitcher in Tim Lincecum. "UTA has probably played the best schedule of all the teams in the tournament so their record is not indicative of how good they are." The Razorbacks (9-0) are ranked No. 8 in the National Collegiate Baseball Writers Association poll, No. 11 by Baseball America and No. 19 by Collegiate Baseball. Nick Schmidt (0.47 earned run average) and Chris Rhoads (0.59 ERA) each sport 3-0 records. Schmidt is scheduled to pitch Thursday against Hawaii (11-3). The 'Bows will start Steven Wright (3-0, 1.82). Lincecum, a two-time All-Pac-10 first-team selection, is 2-0 with a 3.71 ERA. The junior right-hander has fanned 33 batters in 17 innings. Texas-Arlington (3-7) is led by Kyle Thomason, who is hitting .375. The Mavericks' top starter is Austin Bridges (2-1, 3.68 ERA). The tournament format is changed this year due to the travel arrangements for the Razorbacks and Mavericks, who have to return to the mainland in time for Monday classes. There will not be semifinal-round games Friday or the traditional third-place and championship games Saturday. Washington will play either Arkansas or Texas-Arlington in Friday's first game, with UH playing the other team. The Razorbacks and Mavericks play the afternoon game Saturday, with the Rainbows and Huskies playing that night. "I don't know how we will work out the pairings for Friday or determine a champion yet," Trapasso said. "If one team goes undefeated, they can take the trophy home. This early in the season, we all want to play five games against good competition. That is what is really important now." UH freshman right-hander Matt Daly (2-0, 1.35) will start against UTA tonight. Senior right-hander Justin Costi (0-0, 15.88) gets the start against Washington tomorrow. The Rainbows' rotation of Wright, Ian Harrington (2-1, 3.28) and Mark Rodrigues (1-1, 4.64) finish the week. Note: Hawaii and Texas-Arlington have not played before. The Rainbows lead the Washington series 11-5. Arkansas has won four of seven games against UH. 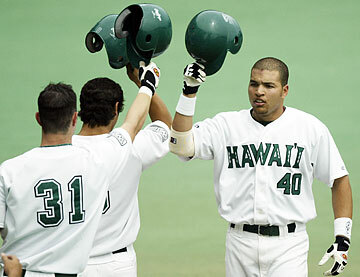 ... Louisiana-Lafayette won the tournament last year, and Hawaii won in 2003 and 2004.